(June 11, 2009) Enjoy the Music.com, a leader in consumer electronics audio equipment and music reviews for approximately 15 years, has partnered with HIFICRITIC magazine. This marks the seventh magazine that has joined what has been referred to as the Internet's leading site for high-end audio consumer electronics reviews and information. Coming on the heels of this week's announcement of VALVE magazine joining Enjoy the Music.com, this once again extends and broadens the ability of the site to reach enthusiasts in virtually every facet of high-end audio. Technical Editor Martin Colloms and Editor Paul Messenger see this as a mark of increasing recognition for their professionally produced print publication directed at serious stereo enthusiasts. "In what some consider a foolhardy venture there is no advertising in HIFICRITIC, and this is claimed to deliver to the reader a higher level of independent feature writing and review opinion," said HIFICRITIC's Martin Colloms. "In consequence, Enjoy the Music.com had to rethink their commercial model with respect to magazine affiliation to make the inclusion of HIFICRITIC a reality and we thank founder and editor of Enjoy the Music.com Steven R. Rochlin for making this possible. We aim to make this affiliation help readers and web visitors by increasing accessibility to our valuable audio resources." "We welcome having HIFICRITIC magazine partner with Enjoy the Music.com and admire their technical prowess within the publication's high-end audio reviews," said Editor Steven R. Rochlin of Enjoy the Music.com. "They have taken the proverbial road less traveled by accepting no advertising and, as a result, relying on their subscribers to help finance their venture. HIFICRITIC has a staff with an immense knowledge of technical understanding and regularly publish articles that educate their readership. While a new model of partnership had to be achieved on our part, the sheer quality of their reviews and articles made the decision an easy one to make. As a benefit for Enjoy the Music.com readers, they will be privy to the table of contents and editorial plus will also enjoy an additional article at no cost from each edition of HIFICRITIC." The independent London-based British magazine HIFICRITIC, now in its third year of publication, is devoted to high quality stereo sound reproduction. It carries no advertising and while there is an invaluable web site packed with articles and historic sound quality ratings, the magazine itself may only be obtained in print form by subscription or by single issue purchase. We have an active forum which is distinguished from the usual melee by frequent contributions from our editorial experts. 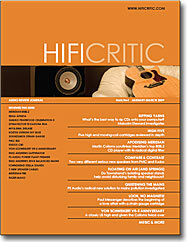 HIFICRITIC publishes material from a wide range of industry professionals. It is not afraid to take on industry giants when they can be shown, through good research and review investigation, that their performance should be improved. Conforming to a classic and much valued model, HIFICRITIC publishes a mix of topical and relevant feature articles, product reviews backed by detailed laboratory analysis partnered by classical and popular music assessments. We make no concession to popular appeal through dumbing down. Instead, it sets a standard comparable to quality journals like The New Scientist. While the HIFICRITIC authors delve deeply into the intricacies of modern audio technology, this comes in a long second place to the purpose of it all, to enjoy the music. Enjoy the Music.com has been the web�s leading information site for audiophile music and equipment consumers since 1995. Over the years the site has received critical acclaim from worldwide Web surfers and other like-minded audio publications both on the Internet and in print. Being affiliated with three prominent print publications while also offering its own Review Magazine, Superior Audio, DIY Magazine and Classic sites � with 120 show reports online to date � Enjoy the Music.com has become the leading Internet authority for diverse information serving both audiophiles and music lovers worldwide. Enjoy the Music.com is also the only specialty audio site with its own Internet browser, mobile device site and RSS feed so their readership can easily find information they desire. Enjoy the Music.com is currently official Internet partners with The Absolute Sound, hi-fi+, The Audiophile Voice, HIFICRITIC, The Sensible Sound, Sound Practices and VALVE magazine.